This probably isn’t true of many quilters, but so many people haven’t ever made a loaf of bread. I hadn’t, at least not since I was terribly young, until I was 35 years old and started taking more of an interest in making my own healthier food. 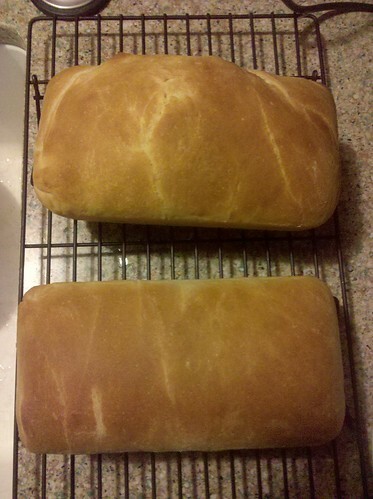 The recipe that really kicked me over was the second one here, the no-knead bread. I had no idea it could be so easy. While some shaped loaves and specialty breads can be more complicated, the most basic breads, the fundamentals, are so stinking easy – it’s just a matter of jumping in and trying it. The thing about bread is, it’s not instant gratification. It takes a little time – most of which is spent letting the yeastie beasties do their thing whilst you go and do yours. In my quest to direct my life (and any who will come along) down a more self-sufficient, less-commercial path, I’ve been trying to cook and bake as much as possible. It’s a path traveled by many before me, of course, but the percentage of folks trying to live a simpler life seems vastly outshadowed by people driving three blocks to Taco Bell for lunch every day. 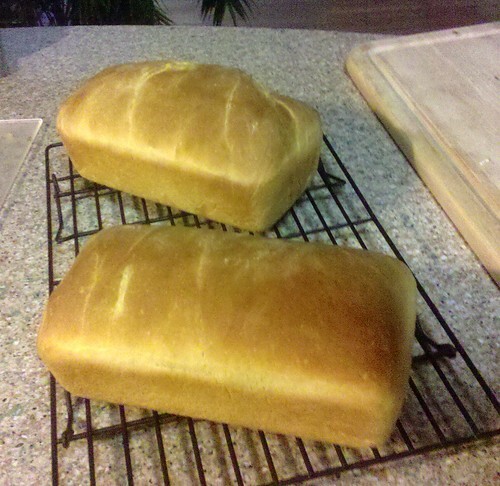 So, here’s a challenge – if you haven’t ever tried making a loaf of bread… do it! Put the Wonder(TM) Bread down and back away slowly! You’ve got this – you can do it. Here are two recipes, two different methods. Each is incredibly simple, each is a great foundation. They’re gateway recipes to give a novice the confidence to bake bread. They’re also really tasty. If you want bread today, use the first one. If you can wait 24 hours (and it’s worth it,) go with the second. Try both! See also the list of add-ins at the bottom. This book is a good basic, tasty cookbook, which provides insight on techniques, equipment and other important stuffs. It’s a great starter book. Nick’s basic white pan bread recipe isn’t bread to kill or die for, it’s not a recipe you’re likely to hand down to your children… but it’s good. As Alton Brown said, “anything you make is better than everything you can buy.” Cuz there’s stuff in the commercial products, chemicals that let it last for a month on the shelf without rotting. Ethoxylated mono and diglycerides. Calcium propionate, just like Mom used to add! This bread takes about 15 minutes of actual work-time, spread out in three spans. Modifying this recipe is a snap – just throw stuff into the dough. If you’ve got a mixer with dough hooks, your life is even easier! It’s great for sandwiches, french toast, dipping into soups – it’s very sturdy and holds together well. 1.) Whisk the yeast into the warm water and set aside while preparing the other ingredients. 2.) To mix the dough by hand, place 5 cups of flour, the salt, and the sugar in a mixing bowl and stir in the yeast mixture and melted butter. Continue to stir until the mixture forms a rough dough. Turn the dough out onto a lightly floured work surface and knead until the dough is smooth and elastic, about 5 minutes. If the dough is excessively soft and sticky, add the remaining flour, a tablespoon at a time. 4.) After an hour’s time, turn the risen dough out onto a lightly floured work surface. Deflate the dough [punch it down or smoosh it out] and divide it into two equal pieces. To form a loaf, make sure the surface is free of excessive flour, then stretch the dough into a rough rectangle. Fold in the short ends to approximately match your pan size. Fold one long side over the middle, and then fold it over again and compress slightly to form a tight cylinder. Place the loaf into the pan, seam side down. Cover the pan with plastic wrap [or a towel] and repeat for the second loaf. Allow to rise [in a warm place] until the dough has nearly doubled, about an hour or so. 5.) When the loaves are almost doubled set a rack at the middle of the oven and preheat to 400 degrees. 6.) When the loaves are completely risen, remove plastic wrap and place into the oven. Bake for about 30 minutes, or until they are golden brown and firm and the internal temperature is about 210 degrees. [Seriously? If you don’t want to poke holes into your bread, or if you don’t have a thermometer, just trust your eyes and your nose. Your nose knows when bread is done. It’ll be golden brown all over, slightly moreso on the top.] Unmould the loaves to a rack to cool on their sides. The bottom loaf being that perfect was a complete accident. I like my loaves to have more character, like the top loaf. However, for the bottom one, I followed the folding instructions exactly to see what it would look like. The top one just got folded up to fit the pan somewhat randomly – I like it better. I’m more of a rustic person. This bread has become somewhat of a phenomenon, and has people who never contemplated baking at all making their own amazing breads. The bold link back there will take you to the Times’ website article. The secret to this bread is just this – don’t mess with it while it’s rising. Don’t knead it, don’t worry about it – just let it sit and do its thing. This is bread in its truest, most primitive form. Hearty and sustaining. This one can be to kill or die for, depending on where you want to go with it. 4. At least a half-hour before dough is ready, heat oven to 450 degrees. Put a 6- to 8-quart heavy covered pot (cast iron, enamel, Pyrex or ceramic) in oven as it heats. When dough is ready, carefully remove pot from oven. Slide your hand under towel and turn dough over into pot, seam side up; it may look like a mess, but that is O.K. Shake pan once or twice [remember that pot is hot!] if dough is unevenly distributed; it will straighten out as it bakes. Cover with lid and bake 30 minutes, then remove lid and bake another 15 to 30 minutes, until loaf is beautifully browned. Cool on a rack. That’s it. I mean honestly – it’s a beautiful, crusty, fricking phenomenal loaf of bread. Moist, with nice crumb. Mmm. Once you get your baseline loaf made, or if you want to experiment your first time out, try some of the following – mix and match. Although don’t put, like, dates with garlic. <shudder> You really can just throw any of these things (and more) into bread dough. You don’t want to overload the senses, but try one or two and see what you like. the sky’s the limit, baby! 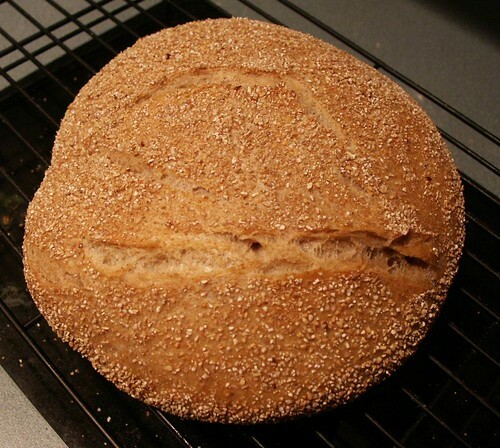 If you try this, I’d love to hear about it, or if you have a favorite bread recipe to share, that would be great, too. Oooh, that does sound too easy!! We used to have a bread machine years ago that we used like twice… I think I wanna try that No-Knead recipe!! Looks freakin’ awesome. It would be the first REAL loaf of bread I would make by hand, that’s for sure. Hot, flaky bread……. MMmmmmmmmmmmmmmm. I’ll take and post pics when I do it! It’s a good first bread, because it’s not fussy, it’s not terribly messy and you don’t have to spend forfrickinever kneading it. Keep it someplace warm whilst it’s rising and you’re all set! Erin you’re awesome. Also, I love people that can use whilst in a sentence. Aw shucks, Justin. 😀 Mike hates it when I say whilst!